With the help of our writers, designers, and developers, we were able to help Redding ophthalmologist Dr. Michael Sumsion create an educational website for his eye care practice. With an attractive layout and menu bars that make the site easy to navigate, viewers are able to locate valuable information about cataracts, glaucoma, diabetic retinopathy, and several other eye conditions. The site also features information about LASIK and other advanced technologies used by the practice to treat an array of vision problems and conditions. Visitors to the site can also learn about their eyes from educational videos covering a variety of topics, ranging from the anatomy of the eye to information about macular conditions. Enhanced with strategic SEO tactics, Dr. Sumsion’s new LASIK and eye care website design helps him to gain more exposure in web searches, broadening his potential client base and allowing him to stay ahead in a competitive field. 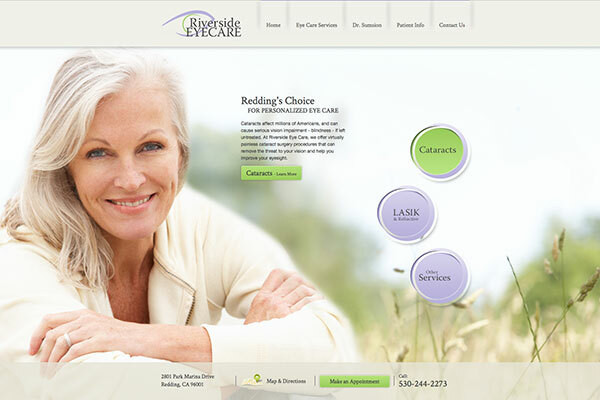 To see an example of customized vision care website design from Rosemont Media, please visit www.recp-eyemd.com.